The CoffeeShop Blog: CoffeeShop Glamour Glow PS/PSE Action! CoffeeShop Glamour Glow PS/PSE Action! I was playing around with different skin softening techniques and I hit upon a method that does a nice glamour skin softening with a soft glow. It is completely different than the skin softening in CoffeeShop PowderRoom and should not be used as a replacement for that action. I personally feel this action is better for portraits of women where you are interested in a more glamorous skin treatment. However, if you use this modestly it is really nice in most portraits (even children and babies) as it makes their skin glow. This action also has the classic Eye Define and also a slightly different method to brighten eyes using the screen blending mode. A few more notes. You can use the Bright Eyes layer to brighten teeth, eye whites, hair, and anywhere in your image you need a bit of brightness. The Eye Define layer is great to "define" parts of your image that need some extra sharpening. It is great on urban landscapes (rust and peeling paint) or nature (tree trunks)! I would be interested to hear your comments on which skin softening is your favorite! Remember, this action does not replace PowderRoom or Perfect Portrait, but is just an additional method for certain situations where you not only want soft smooth skin, but a subtle glow. Heck, download them all, they are FREE! 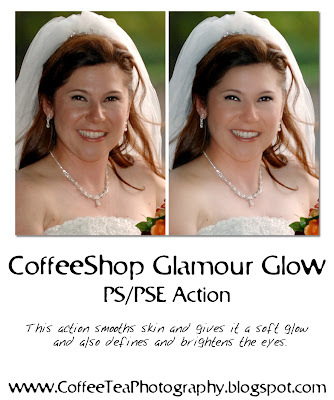 Download the free CoffeeShop Glamour Glow PS/PSE Action HERE! Girl, this is awesome!! THANKS SO MUCH!!! This is too cool! I love it! I KNOW this will come in handy for my many wedding shoots that are coming up!! Thanks! I can't begin to tell you how much time you save me!! BLESS you! I can't wait to try this one.. Thank you much. Thank you so much for this Freebie. I want to let you know that I posted a link to your blog in Creative Busy Hands Scrapbook Freebies Search List, under the Photoshop/Gimp Resource(s) (Brush(es), Swatch/Palette, ...) post on May. 12, 2009. Thanks again. This will be awesome with the Perfect Portrait action (which I love)! You are great! Thank you so much for sharing all your hard work! I am new to Photoshop Elements and new to running actions, but you have made it a breeze. Thank you for giving me the creative ability to make my photos something to be proud of. Just wanted to pop in and say again how much this action is coming in handy on my bridal portraits! Thanks again!! Thanks again. This action is awesome and easy to use. I have edited my previous comment. I am admittedly new to actions, but have successfully been able to get others working. Even when made "visible" I am not able to see any of the layers other than the master. Any suggestions? I am having the same problem as the previous commenter. What am I doing wrong or what did I forget to do? But, I have no idea how to do this action work. All here looks precious very much! No Amy, I don't even know what that is! Thank you so much, a big help for portrait photographer. God bless you..